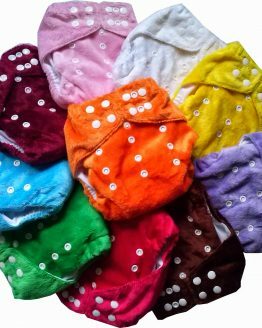 Great quality, affordable cloth nappies and reusable menstrual products. 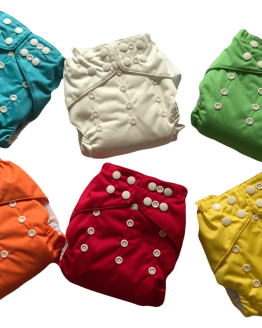 The dinky pocket nappy, the one size fits most, modern cloth nappy that’s a little different. Our Dinky pocket nappy has been designed right here in New Zealand, with lots of great features to make it the ideal nappy for you and your family. 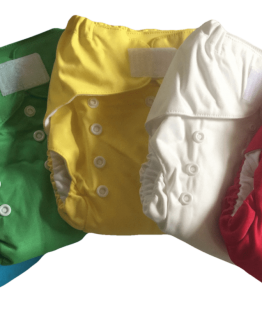 With a wide pocket to stuff, and designed to fit a range of sizes, this pocket nappy is a great choice. The result of eight years of design and testing, the dinky pocket nappy aims to be an affordable, easy to use and reliable cloth nappy. 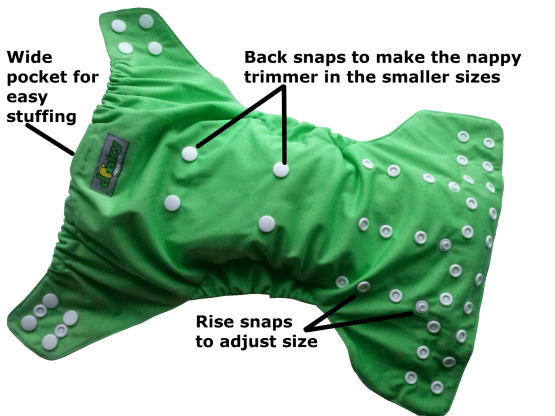 Like many OSFM nappies out there, the dinky pocket nappy has sizing snaps on the front to alter the length (known as the rise) of the nappy, but unlike other nappies this cloth nappy also has sizing snaps at the back of the nappy. These narrow at the crotch and bottom, so on small babies it’s nice and trim, and not too wide. This also helps to prevent gaping at the legs. Double snaps at the waist give a nice snug fit, and with the cross over tabs, it will fit even newborn babies. Now available in a velcro (hook and loop) waist closure, velcro is often easier to get a good fit on wriggly new born babies. 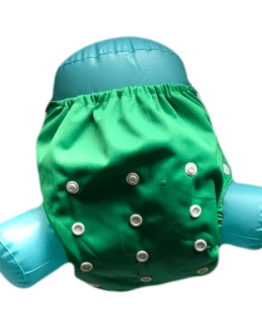 Many OSFM cloth nappies can be quite large on the legs in the smaller sizes. The dinky nappy is different, it has deep wide gussets, that form a better seal, and help keep everything in, in all size settings. There is also a wide area between the edge of the nappy and where the insert sits, making leaks less likely. These gussets also mean that you can stuff the pocket with extra inserts, without pushing the nappy away from the leg creating gaps, making it an ideal night nappy as you little one gets older. Each of our reusable nappies comes with an flat insert, made of two layers, one of microfibre and the other of bamboo. The two work well together taking advantage of their different properties; microfibre absorbs liquid quickly but used alone can leak when squeezed, like a sponge would. Bamboo by contrast takes a little longer to absorb liquid, but holds on to it much better. The large pocket makes stuffing the nappy easy, with a nice big opening; plenty of room to get your hand right in . Once you have stuffed the nappy with with absorbent insert, it is in effect at all in one. You will not need a separate cover, as the waterproof layer is built in. Simply adjust to the right size, and then fasten onto your baby as you would with a disposable nappy. Quick and simple to use. Available in a great selection of colours.